Learn 'The Essential Secrets to Maintaining strong Joints, & Recovering from joint Injury'. Ankle and heel pain is a particularly common complaint in both men and women. There are several common causes for pain in the ankle and pain in the heel. It is necessary to make a correct diagnosis of the cause, so that you can avoid any further injury and begin the proper treatment. Below we shall look at some of the most frequent causes for ankle or heel pain and you will learn how you may start your journey to becoming PAIN FREE naturally without the use of drugs or steroids. Is ankle pain or heel pain stopping you from jogging… playing sports… wearing your favorite pair of shoes… or even stopping you from properly walking any distance? The ankle is one most injury-prone parts of the body whereas the heel is easily irritated by overuse of the foot. The ankle joint is an intricate network of bones, muscles, ligaments, and tendons. Both the ankle and the heel bear the whole weight of your body. Having to support this weight means that when an ankle injury or heel injury does occur then the pain can be so intense that it will generally result in an inability to participate in most physical activities. In particular ankle pain and heel pain will limit jogging, playing sports and even walking for long periods of time in severe cases. Furthermore, many people with ankle pain or heel pain find that they are restricted by which pair of shoes they can comfortably wear. Did you know that active people and inactive people are both susceptible to heel pain and ankle pain? As active individuals are often participating in sports, exercise or outdoor activities their heels and ankles are constantly under different loads and stresses which makes them very susceptible to injury. That said, ankle pain and heel pain is not just limited to the fit and healthy… being inactive can lead to the muscles around the heel and ankle becoming very weak, providing poor strength and support around the heel and ankle. Is your injury acute or chronic? Knowing this could actually help expedite the recovery! When heel or ankle pain occurs it will normally be ‘sudden and acute’ or ‘slow and chronic’. If you are able to identify which of the 2 categories your pain falls into then this may be extremely helpful in identifying and eliminating the cause, which may then dramatically expedite the recovery. It is possible that the foot or ankle pain that you’re experiencing is only prominent when you are doing certain activities or wearing particular footwear. Alternatively you may be feeling constant mild-severe pain even whilst resting. Either way, the level of pain resulting from an ankle or heel injury can be extreme and also debilitating, therefore you should identify the cause as soon as possible so that you can limit any further injury and begin the process of recovering. Have a read of the list below; these are the most common causes of ankle pain and heel pain. Once you have identified the cause of your pain from the list you can then simply click on the associated link to discover some of the possible activities or causes that should be avoided to reduce the risk of further injury. 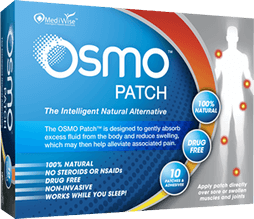 Watch this video to see exactly how the OSMO patch works. We shall also discuss the existing treatment options… and see how the OSMO Patch, our 1oo% Natural treatment together with proper rest is ideal for supporting the reduction of inflammation and the relief of pain caused by many of these common heel and ankle injuries. You may also wish to watch the video on the right to learn exactly how the OSMO Patch works. It can be said that most ankle and heel pain causes fall into four main categories: tendon tear or inflammation (bursitis or tendinitis), instability, wear & tear s or fracture. Bursae are small fluid filled sacs that work like cushions between bones and overlying soft tissues, they help by reducing friction between muscles and bones. Impact or overuse of the heel can cause these cushions to swell as they become inflamed. This condition is known as heel bursitis. The types of bursitis in the heel include Retrocalcaneal Bursitis and Achilles Bursitis. For further information and to discover how the OSMO Patch can help relieve swelling and the associated pain due to medically diagnosed Retrocalcaneal Bursitis and Achilles Bursitis simply click on the link below. One of the major causes of ankle pain is due to an overuse injury of the Achilles tendon. This is known as Achilles tendonitis and you will usually recognize this injury by the sharp stinging pain that greets you as soon as you place weight on it in the morning. Many cases of Achilles tendonitis occur because of the wearing of tendon resulting in small micro-tears. Degenerative changes such as wear & tear can also cause Achilles tendonitis. For further information and to discover how the OSMO Patch can help relieve swelling and the associated pain due to medically diagnosed Achilles tendonitis simply click on the link below. Plantar fasciitis occurs when the fibrous band of tissue that connects the heel to the toes (called the plantar fascia) becomes inflamed. This pain normally occurs after long walks or prolonged standing and can be felt as foot arch pain or heel pain. For further information and to discover how the OSMO Patch can help relieve swelling and the associated pain due to medically diagnosed Plantar fasciitis simply click on the link below. Wear & Tear in the ankle can cause swelling and pain and may also lead to heel bursitis or Achilles tendonitis. For further information and to discover how the OSMO Patch can help relieve swelling and the associated pain due to medically diagnosed heel bursitis or Achilles tendonitis simply click on the link below. Fractures and breaks in the ankle will usually cause extreme pain and should be treated directly by a medical professional as soon as possible. This report is an absolute must read if you have any type of joint pain or for anyone suffering from a joint injury. Discover simple & natural ways to maintain strong and health joints. Why pushing through your pain is often the worst thing you can do. How identifying if your injury is acute or chronic could actually help expedite your recovery. Discovering how to develop a strategy which will help expedite your recovery simply by identifying what activities or movements cause pain. Also we reveal some facts & secrets that the pharmaceutical companies don’t like to tell you. Simply fill in the details below and you will receive an email shortly.